The judge for the Top Dog trial was Cheryl Huffman, who has kindly given me permission to post some segments from her courses this weekend. There were two course sections where I struggled with how to handle Rush through the course because of his speed. 12-13-14-15 is a sprinter’s line–it was all I could do to not get too far behind Rush–and a push to 15. From 15 to 16, not so bad, but then… which way to bring the dog to get to 17? I walked it with a post turn, dog on right, over 16, to a front cross (the red path); I walked it with a push to the far side of 16, rear crossing 16, 180-degree-turn to 17 (the blue path). 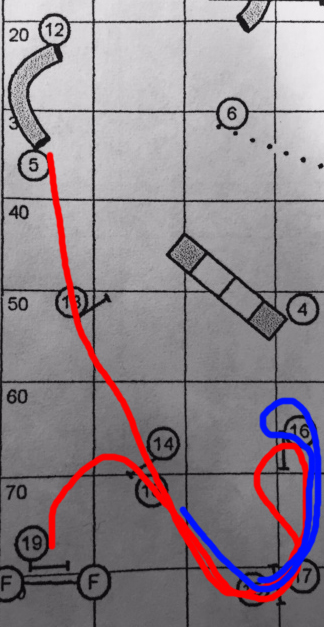 I decided that the push to the outside of 16 (blue) made more sense for Rush. Watching other people handle the turn, most of them chose the red path. You can see video here. Notice that I had to stop Rush just before 15 so I could catch up to him to handle that bit… That would be why I’m trying to get faster. I ran into a different problem in the Jumpers course on Sunday. Here the path from 7 to 11 requires that you push the dog along the line of jumps past the off-course tunnel (the exit end of tunnel 11). When I walked the course, I was worried I’d be so far behind that Rush would turn and see the tunnel. I needn’t have worried. He was going so fast that he bounced 7 to 8 and couldn’t have turned to the tunnel if I’d wanted him to (note to Cheryl: I assume we’ll be seeing that course again, this time with the turn to the tunnel the correct path?). You can see video of the run here. Note the handling error at jump 2, where I stopped, which called him to me instead of over jump 2. Fortunately, he handles backside jumps well, and using the backside meant he had a nice line to tunnel 3. And no refusals are called in CPE, thankfully. This entry was posted in handling analysis, trials on October 21, 2014 by Diana. Yesterday at the Evergreen State Shetland Sheepdog Club trial at Argus Ranch, I watched the Excellent FAST competitors from my in-ring seat as a bar setter. I love bar setting in the Excellent ring. I learn so much from watching the best handlers on the course. No one is talking to you, you see every run with no distractions, and you get to feel good about having such a good seat; the Clubs need their volunteers to run the trial. Okay, let me say upfront that several people decided during the walkthrough that they would do the course only for training, because they didn’t want to be forced to layer a jump. I’m going to ignore any runs that were clearly for training when I discuss what people chose to do. For those of you unfamiliar with FAST, it is a strategy game that requires that the handler accumulate 60 points (in excellent), which includes a required distance challenge (the send) worth twenty points plus the value of the obstacles. 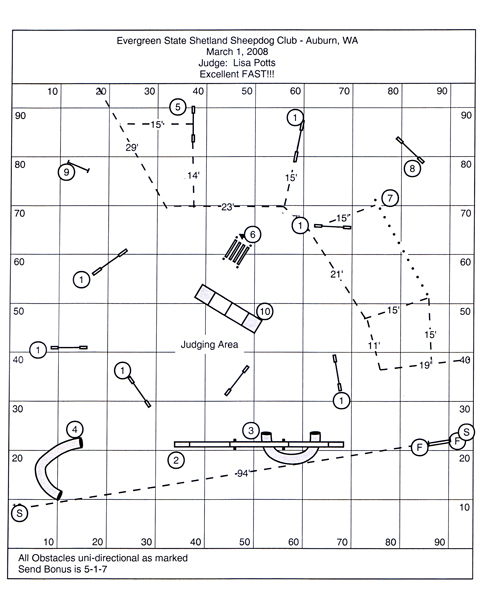 The obstacle value is set by the judge as part of the course design. In this course, the send is worth 33 points, so getting a Q would require 27 additional points and a successful send. There is a limited amount of time to complete the course. Every second over is deducted from the points earned before time ends. If you’re trying to understand how people handled the course, I suggest printing out the course map and tracing the routes described with a color pencil. It really helps to use one color for the handler and one for the dog. The send was 5-1-7 (jump, jump, weave). Not many competitors completed the send successfully–fewer than five of a class of 30. The most common opening was a leadout to the entry end of tunnel 4, followed by the dogwalk and a swing to tunnel 3 (9 points to this point, 18 to go). From there most handlers did a cross to put the dog on the left over the A-frame (ten more points, 8 to go), over the two jumps (1, 9, points finished) and around to the send and out over the finish jump. 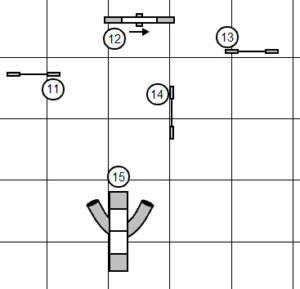 One handler, who did Q, took the dog over the broad jump with the dog on the right, then front crossed to put the dog on the left for the 1-9 jump sequence and the send. Still short on points, she swung the dog back and took the 8-point jump in the corner, then ran hard for the finish jump, finishing as the horn went off. 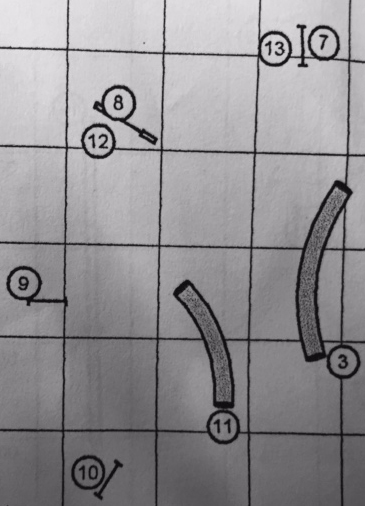 Another option, which I saw two people use unsuccessfully, was to lead out from the dog between the dog walk and the finish jump, take the 1-point jump, then the A-frame, then the 1-9 sequence (all with dog on left, total to here 21 points (6 points to go if the send is successful), then the send. From there, they pulled the dog back to the 8-point jump, then over the broad jump and around the one point jumps and the 3-point tunnel (in one case) or out (in the other case). Both of these handlers crossed the line to complete the send, so they didn’t Q, but they did complete the course within time. Finally, a competitor who was clearly avoiding all contacts chose to do the 4-point tunnel, the two jumps to the 3-point tunnel, the 1-point jump after the tunnel, the broad jump (total to here 15 points, 12 to go), the 1-9 jump sequence (2 to go), the send, the 8-point jump (by stepping in after the weaves were complete, putting the dog on right, and sending the dog from left to right over the jump), and ran hard for the finish jump. I believe this worked for her, although my memory of exactly who Q’d and who didn’t is hazy. This entry was posted in handling analysis, off topic, poodles, trials on March 2, 2008 by Diana.